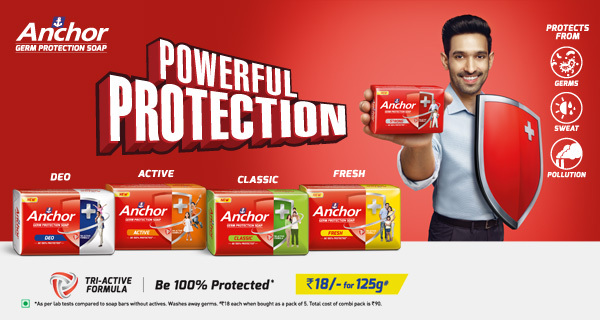 The all new range of Anchor Germ Protection Soap is powered with Tri-active Formula-a unique combination of 3 active ingredients that work extra hard to keep you and your family safe by fighting germs more effectively than any ordinary soap. So go ahead, be 100% protected*. Its pleasing fragrance takes your bathing experience to the next level. Available Rs10 onwards in various pack sizes. Its long-lasting fragrance keeps you fresh all day long. Its enduring fragrance keeps you sprightly and energetic throughout the day. Its evergreen fragrance enhances your bathing experience. Its refreshing fragrance delivers long-lasting results.